Bots are automated characters within Habbo hotel that resemble Habbos. They can often be found in official public rooms and in user's rooms as purchasable Bots. Bots are often programmed with set answers to phrases that a user says. 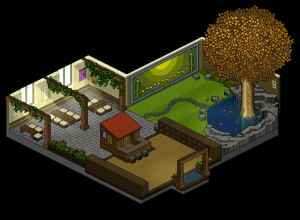 An old feature allowed new users to summon a GuideBot to their room, this would give advice and tutorials about Habbo. Bots have been integral to the Habbo experience since the creation of public rooms in the early years of the hotel. They were present in all hotels, speaking the respective languages. Many of these have now gone, along with their public room home. Asking each Bot for a drink of a certain type would have them give you the item. Motto: Welcome to our Hotel! Please keep it down people are trying to think! Only use the Call for help in an emergency! Want to know more about Habbo Hotel? Ask a Habbo X! Is it me or is something BIG about to happen? In Trouble? Call for Moderator assistance using the Blue Question Mark! There's no such thing as a free lunch or free credits! Why Hello there! *Shakes Habbo Hand* My name's Harry. If you hear a funny noise, it's just Sid the sloth - he loves to sing! Stressed out? The Ice House cinema's the best place to chill out. We've got the coolest DVD playing this week - check it out! Wow! You have a real talent! See a hairy elephant? It's just Manny the moody mastodon. You people are my best customer ever, I like you. I need to get out of the ice cream booth and into the DJ booth! Ow there goes my eardrum! When will I, will I be a famous Habbo who gets on the VIP list? I'm a fiery redhead - come here boys! Purchase tickets at the machine by the pool. It makes me dizzy to move too quickly! Motto: My katana thinks you're cute! Motto: Be safe, not sorry! Ask a Safety X for safety hints and tips. They have an X badge. P2S is giving your furni away! I got this job by smiling sweetly at Redtiz for 40 minutes. This should quench your thirst! Oh to be a star! Perhaps one day soon I'll be recognised? Motto: Chill out and have a coconut! Official Fansite are voted by YOU, the Habbo community! Here you go, hope you like the umbrella. Did you know the Official Fansites are changed every 3 months? You sure are thirsty, huh? If they aren't listed once you click the billboard then they aren't Official! You can only have one at a time! Once refreshed, visit an Official Fansite! Click the billboard now to visit our Official Fansites! Official Fansites have great events, comps and radio shows! That's my name! As in the beams of golden sunshine and not the sunglasses. Welcome Habbo! There are many things to discover in Habbo Hotel! Bullying is never OK - Don't let it happen! Nice to meet you. How are you feeling today? Are you bored? Have a look at the news, there are many things you can be part of! What's your favourite thing to talk about? Let's have a chat! What's up my friend, tell me what you need? (When asking for a drink) In 2 secs! Or 5 secs! A Guide Bot was a Bot that could be summoned by a user to their room. GuideBots gave a user information about the hotel and its features. Dance Click your head icon, and then the dance icon. If you feel like dancing, click the face icon and click dance. Help You can call for help if someone is giving you a hard time. Just click on the yellow question mark icon. Move To move, click the floor on the spot you want to go to. Pets Buy your furry friend from the catalogue. He'll need food and toys to be happy and content and remember, a pet is for life, you cannot give it away! Shout Shouting is not recommended. Make sure you stand quite close to the people you want to chat with. Kick You can kick other users from your room if they are getting too bossy or give hard time. Friends Looking for people to hang out with? Open the navigator and see where everyone else is. FF Participate in some games like falling furni. The trick is to always stand one square away from other users. When the owner drops a chair to the room, try to sit on it. The one left out without a chair is losing. The one sitting in the chair at last is the winner. Falling Furni games are marked as FF or Falling Furni. 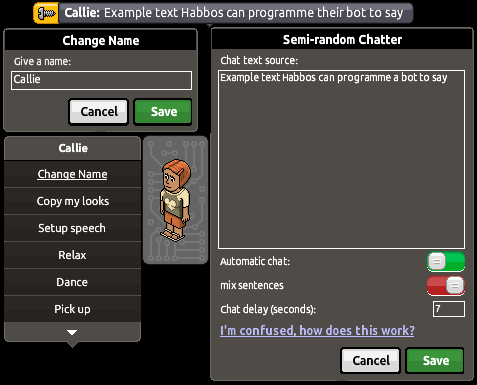 GuideBots have since been replaced with the Habbo Helpers programme. A member of the Habbo Helpers programme can be called to a room in-client by clicking 'Help' and clicking 'Ask for Instructions'. In November 2012, after many years of user suggestion and circling rumours, Habbo finally released a buyable Bot. Before the official release, a few were given out in competitions. The release brought a new page in the Habbo Catalogue, where two types of Bots are purchasable, the Casual Bot and the Waiter/Serving Bot (the former walks and talks, the latter walks, talks and serves drinks including juice, milk, latter, water, regular coffee, decaff coffee and tea).The Visitor Logger bot who records what users enter a room was released later. These Bots are fully customisable, Habbos can change their speech, pace of speech or choose silence. They are often used in Guest Rooms to inform visitors, entertain during shows or serve drinks in themed rooms. They are non-tradable like pets, but can be placed in group rooms if the user is a member with room rights. Bots can be intuitive too. Users can set a base-text of speech the Bot should say, then allow the Bot to create its own sentences. This very often results in gibberish, though sometimes can give personality if re-worked correctly. Bots are subject to the Bobba filter as normal Habbos are, though can often abuse the Flooding rule in the Habbo Way with their speech. This page was last edited on 24 April 2018, at 03:14.